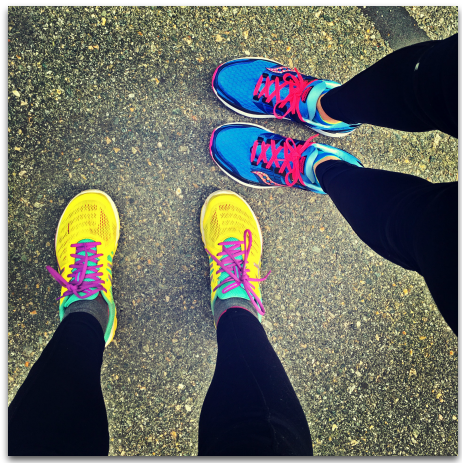 Marathon Training: Over the Half Way Point! This week, as we prepared for the New Bedford Half Marathon, we finished up week nine of our 16 week marathon plan, so thought it was worth a few words. So far, we’ve been very lucky! No injuries and though we have sometimes had to make modifications in the plan to accommodate schedule conflicts (mostly Nora because of her job), things are going pretty smoothly. The brighter the sneakers, the faster we run. Like my Mom mentioned, I also feel incredibly lucky that so far (fingers crossed so I don’t jinx this), I’ve been getting through the training block with no major injuries. The only issue I had was some pain in my heel that I think I mentioned on the blog a few weeks ago. Since experiencing that, I decided to buy a nice, black pair of sneakers that wouldn’t look weird paired with my regular clothes when I went to work. I’ve been wearing those sneakers every single day since I got them, and my feet have never felt happier! I think I will have to save my cuter, more fashionable shoes for after May 8th. The other challenge has been all the travel I’ve had to do for my job lately. I spent a week in Texas, and missed every single workout while I was gone. My ankles also ended up covered in fire ant bites and blisters from that trip, and it took several days for the swelling to go down – not ideal for training. 😦 Running New Bedford after that trip was definitely challenging, but I’m hoping my fitness will bounce back quickly. 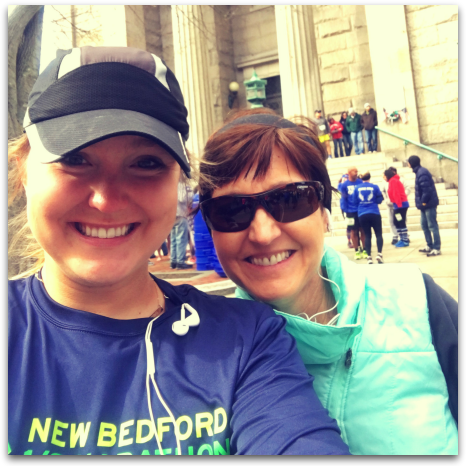 On Sunday, we ran the New Bedford half and since this was Nora’s birthday week race we thought we would not be too aggressive, but just try to have some fun. Despite it being another cold morning for the first day of spring and our enthusiasm levels being somewhat low, we both managed to enjoy the day and run great races! I took 2 minutes off my previous best from the Cox Providence Half, and finished just a few minutes behind Nora. This was my 13th half, and Nora’s 14th, which is crazy to think about. We celebrated at home with a delicious home-cooked meal of bacon-wrapped scallops, salads and cheesecake (Nora’s favorite). March has been our own running-inspired version of March Madness with 3 races in 4 weeks and now the two of us are both looking forward to a break from racing until the marathon. This entry was posted in Uncategorized and tagged 2 Generations Running, Delaware Marathon, Marathon Training, New Bedford Half Marathon, New England, Running, Thoughts of a Runner. Bookmark the permalink.